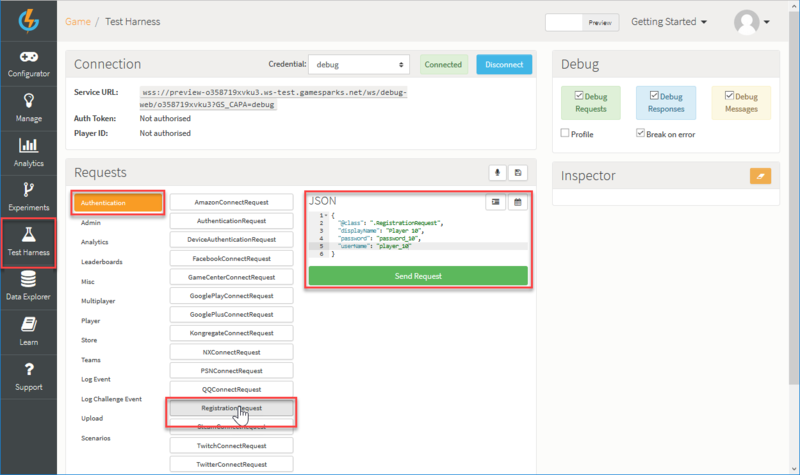 We'll use the Configurator to create an Event that will then trigger a simple piece of Cloud Code. 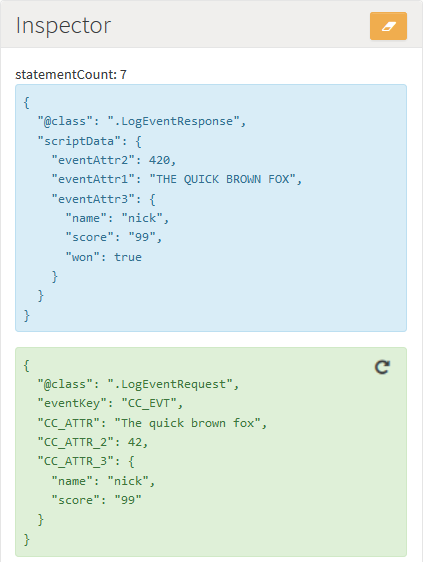 The Event will contain three attributes - a String, a Number, and a JSON field. We'll then use the Test Harness to try out the Cloud Code script and the Event. Cloud Code Best Practices! Before you start to build out the Cloud Code for your game, we strongly recommend that you read the Cloud Code Best Practices guide. This will help you to avoid creating Cloud Code structures that might compromise your game's performance and suggests ways in which you can check and review your Cloud Code's performance and efficiency. FAQs? You can review Frequently Asked Questions about creating and managing your Cloud Code scripts. 1. Go to Configurator > Events and click to Add an Event. The Add Event page appears. You are taken back to the Events page where the new Event is listed. 3. To edit the new Event, click the Edit icon. The Edit Event page appears. 4. Next, on the Attributes panel click to Add an Event Attribute. 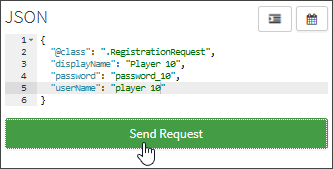 The Short Code will be used as the key for the value that you post into the GameSparks platform from your game code. Set the Data Type to String. For Default Aggregation Type select Used in Script. 6. Click to Save the Attribute. 7. Repeat this step and create another two Attributes for this Event, one with Number for its Data Type, the other with JSON for its Data Type. 8. Click to Save and Close the editing changes you've made for the Event. 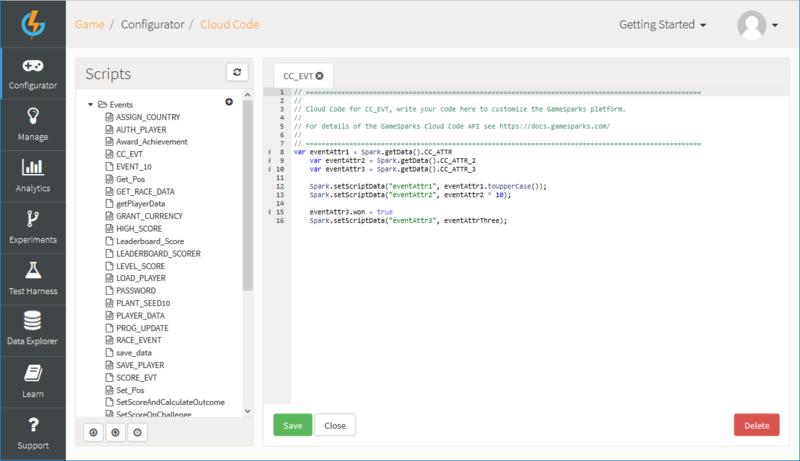 In this section, we'll create a Cloud Code script linked to the Event that we've just created. Cloud Code Editor Shortcuts? For a list of the keyboard shortcuts you can use in the Cloud Code Editor, go here. 9. Go to Configurator > Cloud Code. 10. Select Events in the Scripts section. 11. Select the Event we've just created - CC_EVT. We'll now bind Cloud Code to it. The first three lines of the script use the Spark.getData function to access the attribute values of the incoming Event. Notice how these attributes match the values we entered for the 3 Event Attribute Short Codes in the previous section. The first line takes the first Attribute and converts it to uppercase. The second line multiplies the second Attribute value by 10. The final two lines add a new property to an incoming JSON object and assign that to the response. We're now ready to test the code via the Test Harness. Use the Test Harness to register a test player with the preview version of the game. Post an Event that will trigger our Cloud Code script. We'll then see the JSON requests and responses containing the data inserted by the script. 1. Go to Test Harness > Authentication and select RegistrationRequest. Note that in this example, we've removed "segments" from the RegistrationRequest. 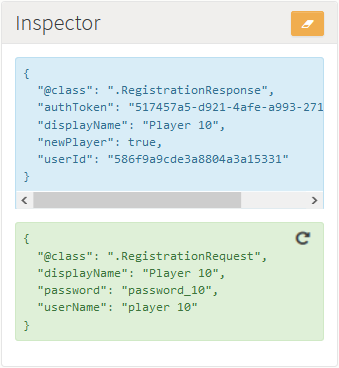 The Inspector shows the request (in green text) that was sent to the GameSparks platform via the WebSocket and shows the response (in blue text). 4. 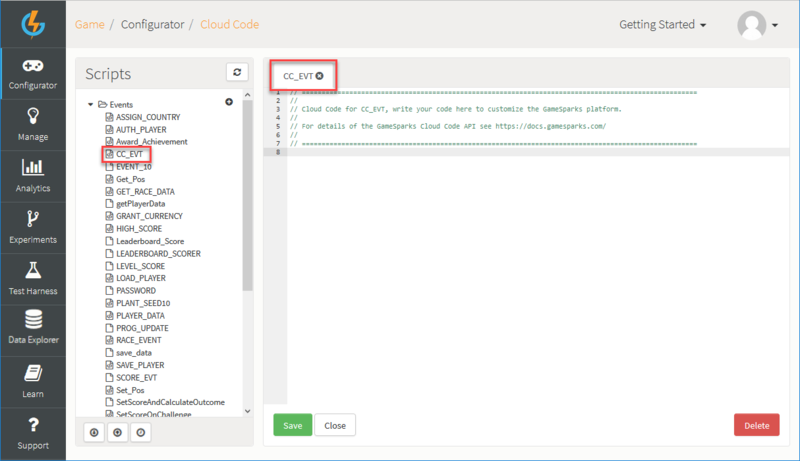 Go to Test Harness > LogEvent section and select the Cloud Code Event that we created above. The key names are the Short Codes of the Event Attributes that we created at the start of the exercise. The first must be a String. The second must be a Number. The third must be a JSON object. 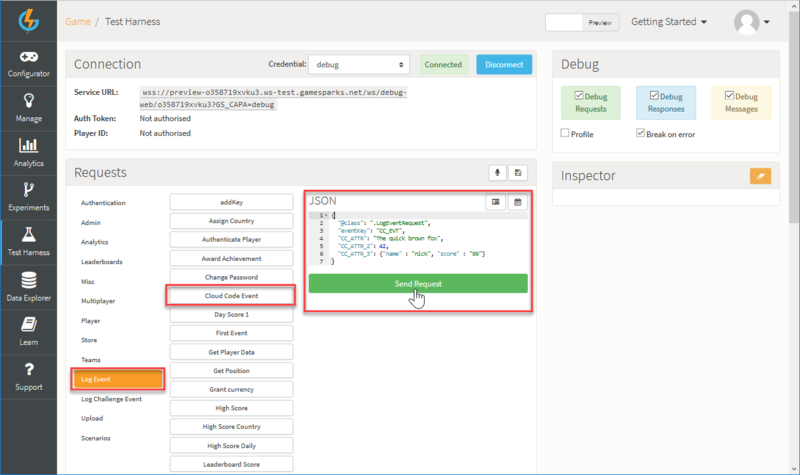 The scriptData property contains the fields that we added from within our Cloud Code script. The keys are eventAttr1, eventAttr2, and eventAttr3. To learn more about constructing messages and seeing an example use, please check out the chat tutorial.